The International Green Week Berlin is an outstanding, engaging event which is ideal for learning about traditions and know-how and which captivates visitors. It is a unique setting in which the work of men and women involved in farming and in the food industry gets the recognition and appreciation it deserves. This event is popular with Moroccan farmers and cooperatives because it provides a precious opportunity for valuable, direct contact with German consumers. It is also an event which offers a unique opportunity to explore a specific facet of the vibrant German economy, which stands out as a model for the achievement of prosperity – a model that has managed to innovate and to adapt to global developments and trends. Consequently, we are deeply satisfied and grateful that Morocco has the privilege of being Partner Country for the 81st International Green Week Berlin. We are therefore pleased to take part in it with a pavilion which is worthy of this important event, as well as a rich program of activities through which we invite visitors to discover our country and its agriculture. 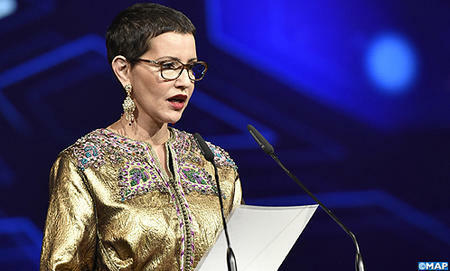 This year’s International Green Week Berlin illustrates the dynamism of the partnership between the Governments of the Kingdom of Morocco and the Federal Republic of Germany in the areas of agriculture and the green economy. It also reflects the special, time-honored relationship between the two countries and is fully in line with the desire to deepen and consolidate our cooperation across a wide range of sectors, thus promoting closer ties between our two nations, our economies and our societies. In ten months’ time, Morocco will be hosting the COP 22 in Marrakesh. This global event on African soil clearly shows the extent of Morocco’s commitment to some of the most important issues on the global agenda, such as food security, sustainable development and climate change. Morocco has opted for an agricultural strategy whereby it seeks to achieve two forms of sustainability: that of the environment and that of the living conditions of rural populations. In 2008, my country launched the Green Morocco Plan. This is a major project in which the economic, social and environmental dimensions of sustainable agricultural development are duly taken into account. Morocco is starting to reap the fruit of this Plan and, as a result, the country’s agricultural GDP increased by 44% between 2008 and 2014. The first is “solidarity-based agriculture,” : it promotes integrated projects and the establishment of fair trade outlets for the benefit of small producers; more than 540 such projects have been implemented, leading to a significant increase in revenues. Particular products, such as argan, saffron and prickly pears, feature strongly in solidarity-based farming and are already doing very well on the global trade market. The second dimension is that of water resource management; this is a crucial issue for a country like Morocco. Two major programs are designed to optimize the use of water resources for farming purposes: the national program for irrigation water saving and the expansion program for dam-based irrigation. The third and last dimension is that of plantations, which concerns the conversion of one million hectares into orchards and olive groves. Today, the area planted with olive trees alone covers more than one million hectares, and nearly 3 million date palms will be planted by 2020. These projects enjoy the support and confidence of international funding partners and sponsors, including the Global Environment Facility (GEF). Morocco has always welcomed investment because it contributes to the country’s economic development, creates wealth and provides jobs. All in all, the Moroccan economy is rooted in solid fundamentals and has been enjoying sustained growth. Morocco’s economy and trade are open to the world. My country has signed a number of free trade agreements, which offer access to a potential market of over one billion consumers. The Moroccan business environment is constantly revamped, and Morocco moved up 36 places in the World Bank’s “Doing Business” index between 2012 and 2015. Furthermore, Morocco’s special relations with its neighboring sub-Saharan nations, especially in West Africa, means our country can serve as a gateway for economic operators wishing to make the most of the engine of African economic growth. In the agribusiness sector, these benefits are accompanied by sector-specific incentives, in addition to the advice and support offered by the Agricultural Development Agency, measures to encourage public-private partnerships, land mobilization and the creation of industrial ecosystems in agribusiness and processing. The dynamism of the agricultural sector is also illustrated by the growing success of the Meknes International Agricultural Fair. The 10th Fair, in 2015, received more than one million visitors as well as participants from 60 countries who came to engage with more than a thousand Moroccan exhibitors. “Like a tree whose roots are firmly embedded in the depths of Africa and whose leaves flutter in the air of Europe”. That is how my revered father, His Late Majesty King Hassan II – may he rest in peace – perceived Morocco’s location, at the crossroads of two continents. Morocco is a country made up of many cultural components; a nation which is proud of its traditions, but which is clearly open to modernity. Agriculture is at the heart of the nation’s heritage – both tangible and intangible. It is the result of centuries of attachment to land, of ingenious resource management and of commitment to quality and sustainability requirements. Thanks to its hydraulic potential and exceptional biodiversity, Morocco has remarkable agricultural assets and is located near the largest consumer market in the world. Morocco is a country with high agricultural potential, as shown by its fruit and vegetable exports to the world. Today, Morocco is the 4th largest exporter of clementines, the largest exporter of green beans, the 3rd largest exporter of canned olives and the 5th largest exporter of strawberries. These achievements are all the more promising as our agricultural business performance goes hand in hand with the significant and responsible development of local products and of family farming. We invite you to come, as of tomorrow, to the Moroccan pavilion where you will be welcomed to four thematic spaces showcasing four facets of the Kingdom’s vast potential in this area.